The system sports a 13.5-inch, 1080p touchscreen, and a keyboard covered in "Alcantara," a cloth-like material also found on the Surface Pro 4. The keyboard also plays home to Dolby Premium Audio speakers, emanating sound from around the keys. 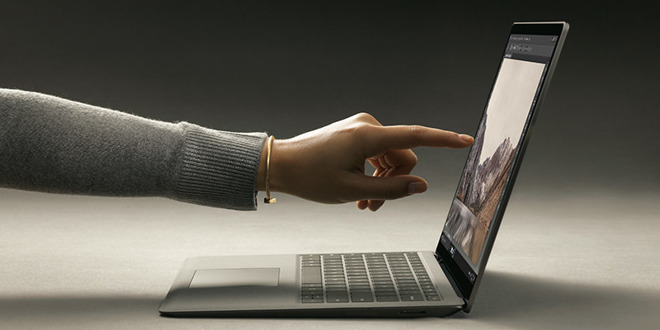 Unlike the Surface Book, the Laptop's screen won't detach to become a tablet, or use a special hinge. Underneath the hood, the base configuration includes an Intel Core i5 processor, 4 gigabytes of RAM, and a 128-gigabyte SSD. Those low-end specs allow Microsoft to undercut Apple's own ultralight 12-inch MacBook. 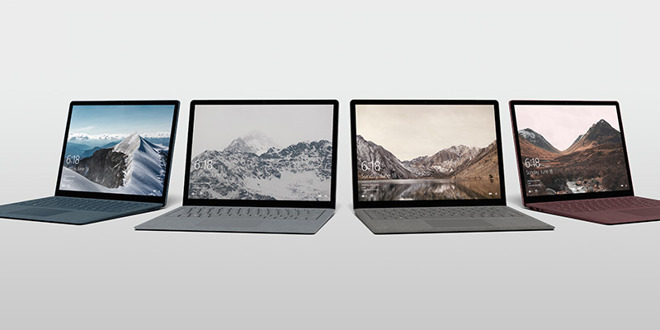 However, beefing up the RAM to 8 gigabytes and storage to 256 gigabytes, which matches the entry-level model of the 12-inch MacBook, raises the Surface Laptop's price to $1,299 —the same as Apple's ultraportable. One key difference, however, are the Intel processors: Apple opts for fanless low-power designs to achieve a thin profile, and Microsoft has instead chosen the more powerful Core i series. 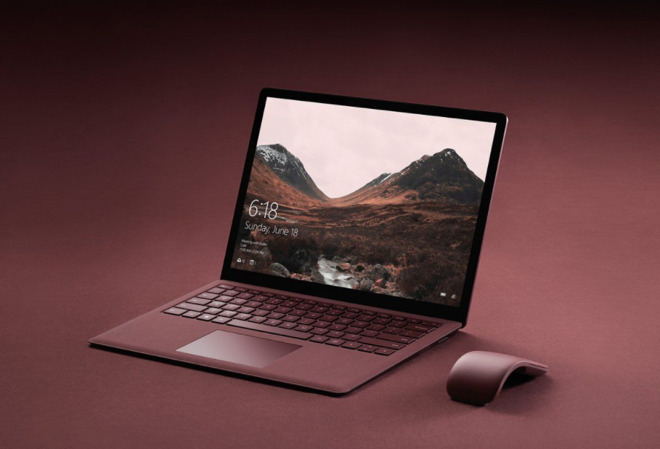 Upgrade options for the new Surface Laptop go up to Intel Core i7 CPUs and 512 gigabytes of SSD storage. A maxed-out configuration with 16 gigabytes of RAM and 512 gigabytes of storage start at $2,200, though it is only available in the platinum color, excluding graphite gold, burgundy, and cobalt blue. Core i7 configurations are claimed to be up to 50 percent faster than Apple's equivalent MacBook Air —a legacy notebook that is upgradeable to a previous-generation Core i7 CPU but has not been refreshed in years. 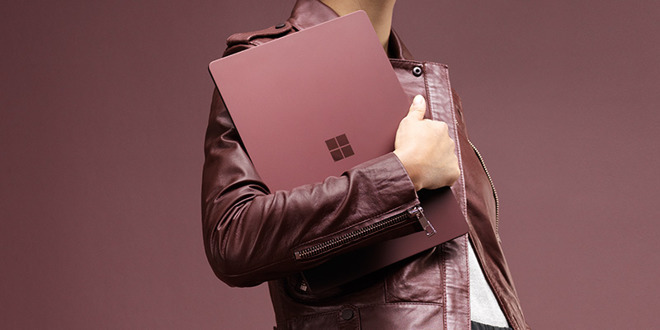 Microsoft is also promising as much as 14.5 hours of battery life, 2.5 hours more than Apple's outgoing MacBook Air. In comparison, Apple's 12-inch MacBook is advertised with up to 10 hours of wireless web use, and up to 11 hours of iTunes movie playback. Other features in the Surface Laptop include USB and mini DisplayPorts, plus an SD card slot. Four colors will be available when the Laptop launches on June 15, though the Core i7 models are said to ship before Aug. 15. Battery performance is said to stem partly from the option of Windows 10 S, a stripped-down version of Windows that will only be able to run Windows Store titles, reducing security risks and overhead. Schools will be able preload apps using USB sticks, and Microsoft is separately preparing a classroom option for Teams, its Slack competitor. In fact, the OS will come with a free year of Minecraft Education Edition, as well as Office 365 for Education with Microsoft Teams. While the Surface Laptop will cost $999, eventual third-party Windows 10 S PCs will start as low as $189, targeting similarly-priced Chromebooks. Devices with Google's Chrome OS currently account for over half of the U.S. K-12 school market. Aside from price, Chrome OS has proven popular with schools because it's cloud-based, making it easier to manage devices en masse and hand them off to different students. Apple is now third in the U.S. K-12 segment. Cost may be the overriding issue, since even a MacBook Air is $999 new, before any educational discounts. The cheapest non-refurbished iPad is $329.